SASKATOON – It was a monumental win. 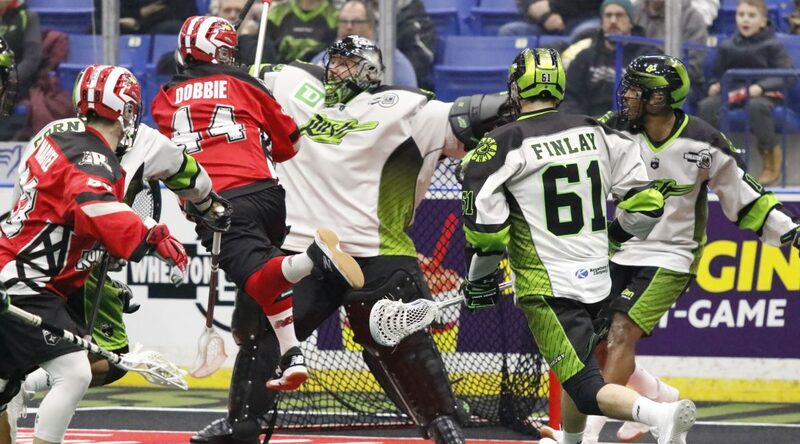 The Roughnecks rallied back after a tough start to defeat the Saskatchewan Rush 17-12 at the SaskTel Centre, their first ever win in Saskatoon and first win over the defending champs since April 29, 2017. “We knew that we hadn’t won here, obviously,” echoed coach Curt Malawsky. Dickson (4g, 7a) had his best game offensively this season, while Dane Dobbie (4g, 6a) dropped a ten-spot on the board – his most productive outing of the campaign. Tyler Pace (4g, 3a), Rhys Duch (4a), Mitch Wilde (1g, 2a), and Zach Currier (3a) were the other top contributors on the evening. The Riggers weren’t solid out of the gate, allowing the Rush to take a 5-2 lead after fifteen minutes. Dan Taylor (1g), Dickson, and Dobbie strung together three goals to tie the game at five in the opening five minutes of the second quarter and would finish the half tied at seven. The Riggers then dialed up a sensational second half. Things began to click on both ends of the floor and the team was able rack up a season-high seventeen goals. Dobbie, the Roughnecks franchise leader in points, set the bar even higher as he eclipsed the 800-point plateau on an assist of Tyler Pace’s third-quarter tally.